As we enter the final hours of 2014, I was thinking of writing about new year's resolution. But nothing comes in mind for I don't believe in making one. Instead, the word letting go crossed my mind. 1. Clutter. 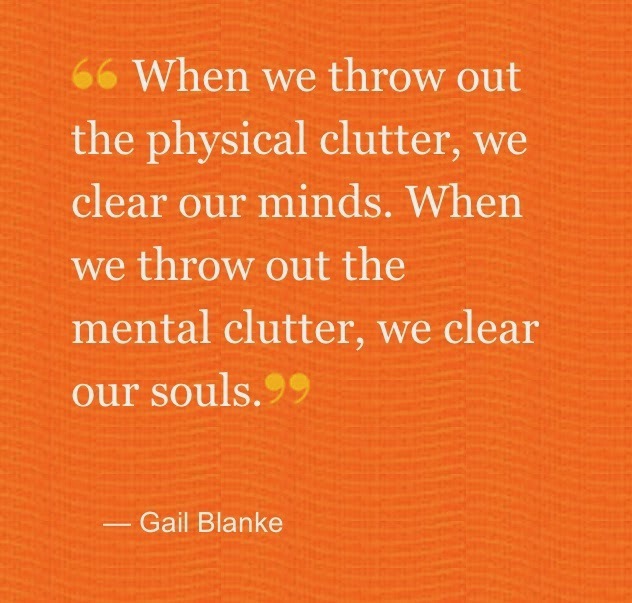 Clutter is a problem that many people struggle with, and unfortunately, it can lead to constant continued stress and inefficiency. Who doesn't want a more simplified and organized life? So start packing those clothes, shoes and bags you haven't used for a year. Give it away, you'll feel better. 2. Guilt. Guilt is something we all face at some point in our lifetime because of something we did, and dealing with it can sometimes be difficult. I say, forgive yourself. No one else can make that guilt go except you. 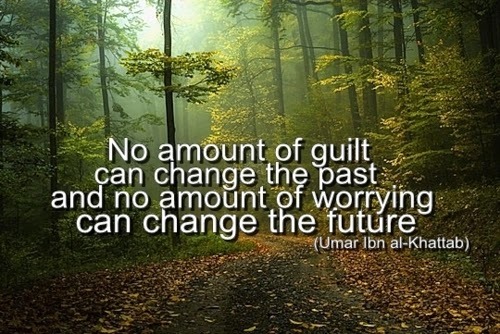 Do not let the guilt of your actions haunt you for the rest of your life. You have to move on from your past and give your present a chance. 3. 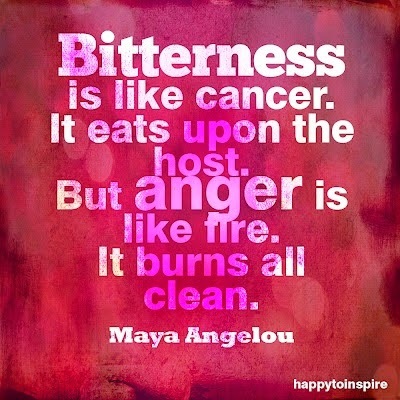 Anger and Bitterness - Holding on to anger and bitterness is potentially hazardous to health . It creates tension and stress that may lead to high blood pressure or worse, heart attack. Remind yourself that anger hurts you more than the person you are angry with. 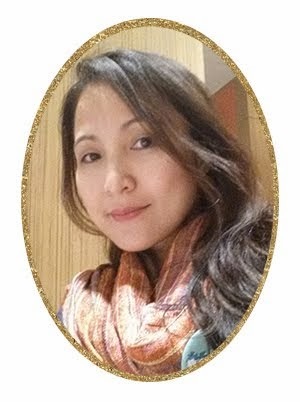 Visualize anger and bitterness melting away as an act of kindness to yourself. 4. Debt. Live within your means. Stop buying expensive stuff just so you can show off. Getting rid of debt changes everything. 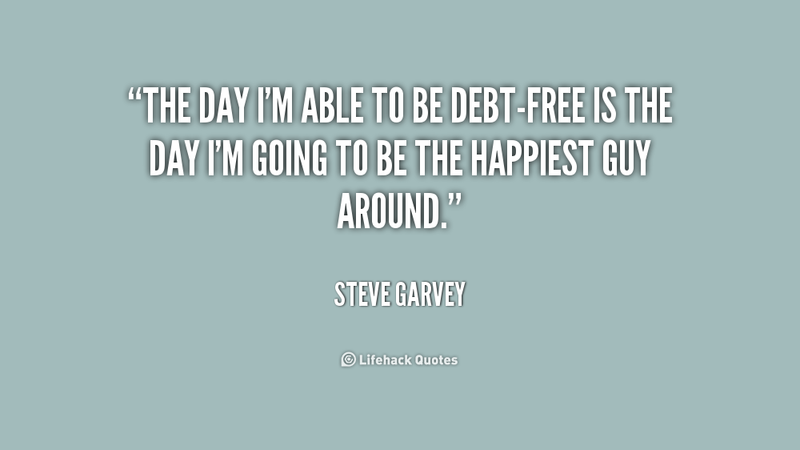 It will change your relationship with money and give you freedom that you can’t imagine. You can also sleep well. 5. 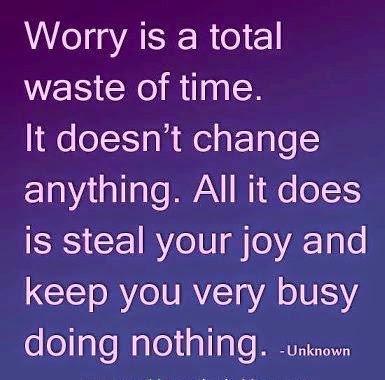 Worry. Worrying kills happiness. Let go of the fear of the unknown; take one small step and watch the path reveal itself. Live each day as if it's your last day on earth. 6. Negative Perception. 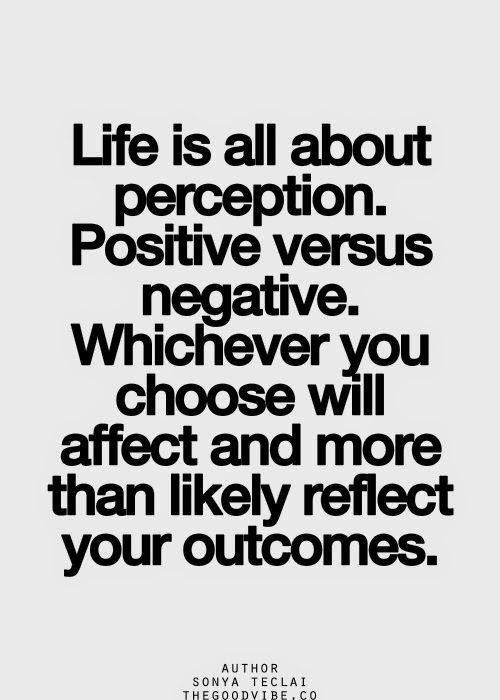 Change your perception from negative to positive. It’s one of many stories that remind us if you think you can’t, you can’t, and if you think you can, you can! 7. 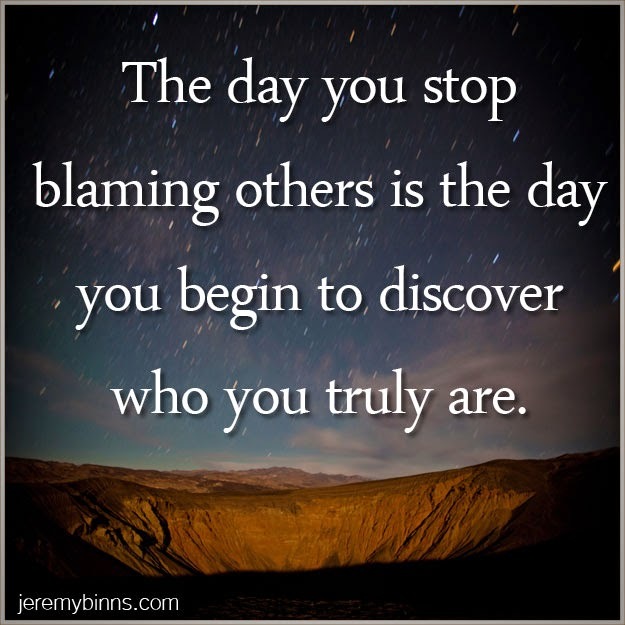 Blaming others. Let go of blaming anyone for anything and be accountable for your own action, for by doing so, you empower yourself. Your destiny awaits your decision, not of someone else's. 8. 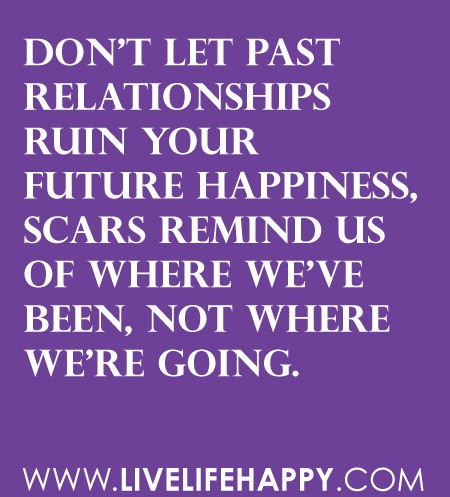 Past Relationships. Some people come into your life just to strengthen you or make you stronger. Simply forget the past, look straight ahead and forge toward the future. Letting go of anything in life isn’t easy for most of us. It's a little scary because we are accustomed into holding on to something or someone we love but letting go is necessary for it is an amazing act of self-love, well-being and growth. Having confidence and a high self-esteem will benefit a child when he or she is an adult. One way to help your kid or kids achieve these two characteristics is by awarding children at home. 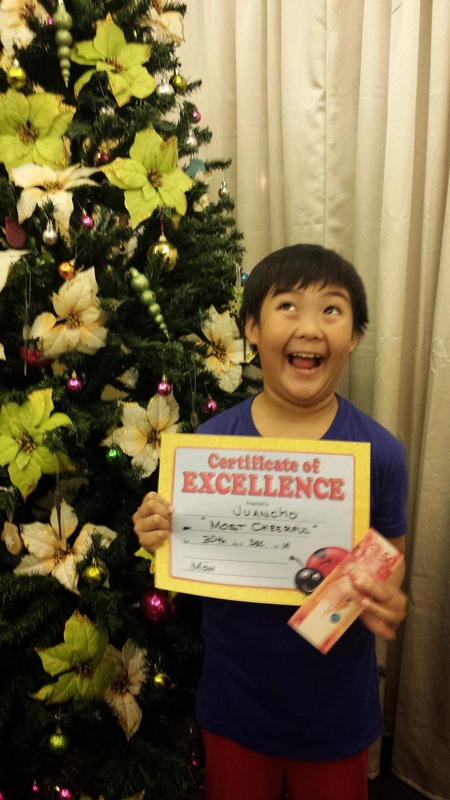 Have you noticed that kids tend to feel good when they know that their effort is recognized? Try telling them over and over that they they are naughty, and that's what the kid will manifest. Give children recognition awards in every area of their lives to encourage them to be better, and more importantly to make them feel good about themselves. By teaching children to pitch in around the house, it helps them learn responsibility and organizational skills. Parents can recognize the good work that their children have done around the house by giving them awards like what we do at the end of the year. 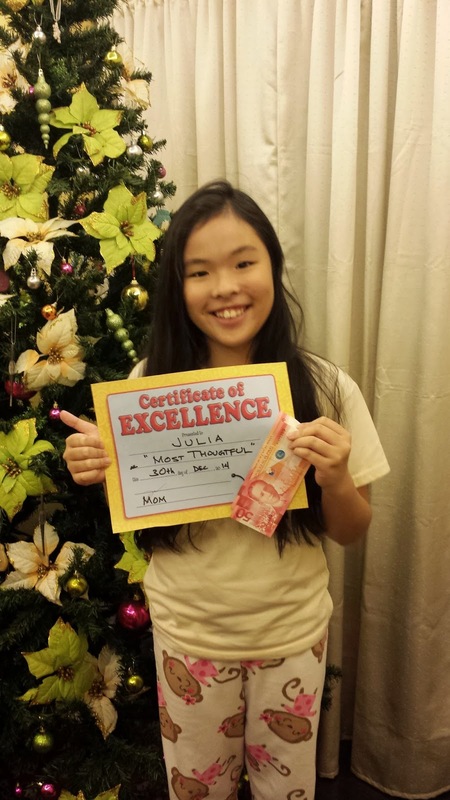 At 12 years old, twins Julia and Rafael find it funny to receive recognition certificate, but they surely like the P100 that comes with it, lol! You can award your child for having a clean bedroom and performing other household chores, or by choosing the award that best suit your kids. Why do we give them money as part of the award? Well, we are also teaching them how to handle their money wisely. Julia is Most Thoughtful for always making a card for me and her Dad of every occasions. El received an Early to Bed Award for sleeping the earliest. 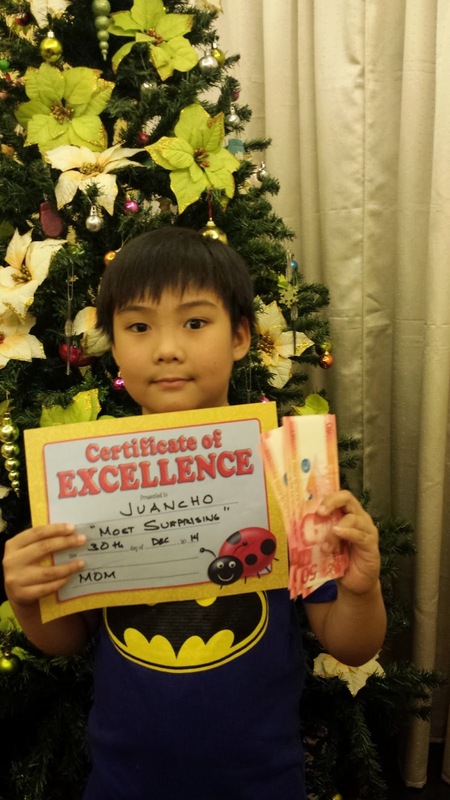 Juancho received the Most Cheerful, dapat pa bang i-explain? El's got the Cleanest Room Award because he keeps it neat which makes it easier for me to clean. 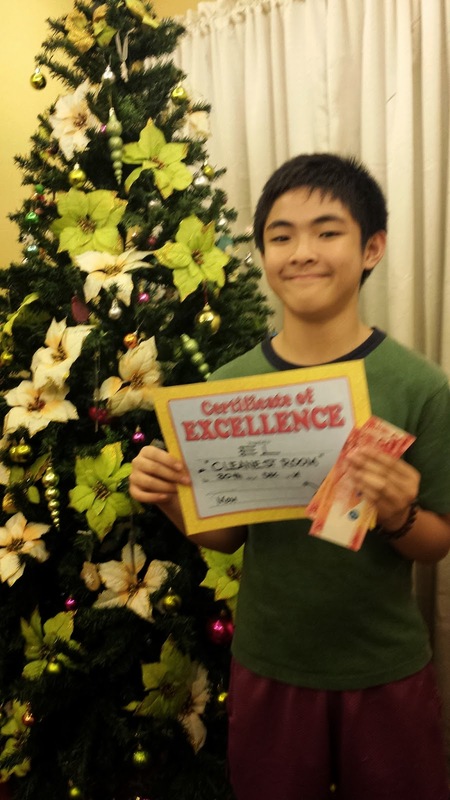 because he brings home medals from school from winning quiz bee even if he does not study at home. 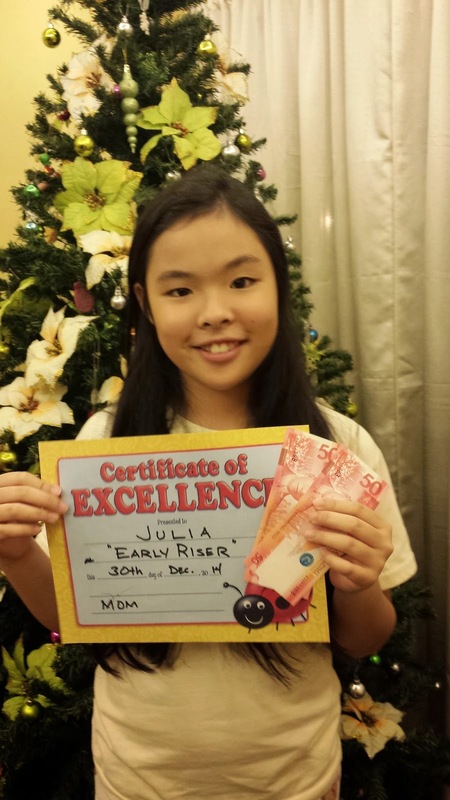 Julia as The Early Riser because she has the discipline to wake up at 5:30am during school days. yet we forget that he is someone today." As John and I were having coffee early on Christmas day, he said, "let's go to Bicol today". Although I've been wanting to see the place (for as long as I can remember) where my mother was born, I wasn't prepared to pack our bags that fast. Plus the kids were still asleep so I told John, "how about tomorrow so I can fix all the things we need to bring?". My husband knows that I hate hot weather, so he said, "let's go there while its cold and be cool at Bicol". The next thing I know, I was grabbing whatever I think we need for the impromptu Bicol trip. Our first destination was CWC to wakeboard but we arrived around 1am at Naga. Since we didn't have a reservation to any hotel, we parked at the first site of Flamingo Hotel. I'll make a separate review about this bed and breakfast. We left as soon as we finished our breakfast. On the 26th of December, 9am, we were at Camsur Watersports Complex (CWC). It was so cold that day that Juan and I decided not to wakeboard. Juan and I checked out CWC accommodations. By 2pm we were on our way to Albay. Then in Mayon, where we were not allowed to go near because of the recent eruption alert. It was a rainy-foggy kind of day so Mayon Volcano didn't show her perfect cone. The rain poured harder when we reached our third and last stop in Leagaspi City inAlbay. Lignon Hill hill stands at 156 meters (511 feet) tall and has the best view of Mayon Volcano and the whole Albay. Unfortunately, because we arrived around 4pm and it was raining the clouds covered most of the view. At least Juancho got to enjoy zipline. 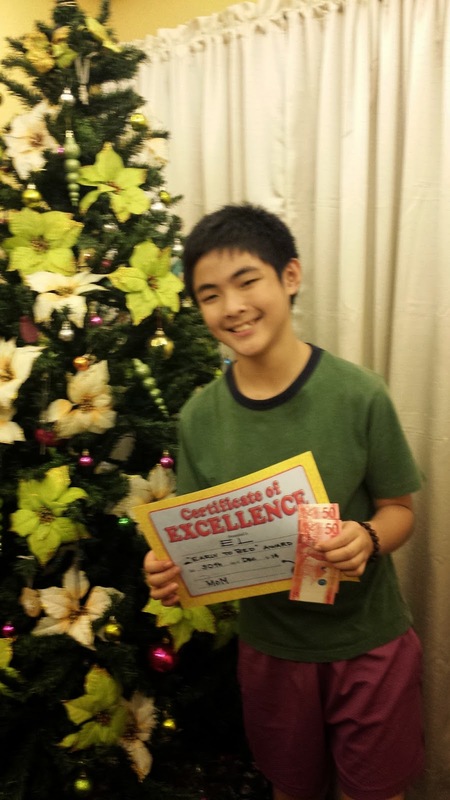 For P250, he got to ride twice, plus a souvenir photo. We were supposed to find a hotel near the port going to Caramoan Island for an early boat ride but the rain stopped us from seeing the road signs so we headed back at CWC where we spent the night at the Cabin. On the 27th, upon the recommendation of CWC Front Office, we were booked at Gota Village at Caramoan Island. From CWC, an hour or so drive going to Sabang Port and two hours drive going to Caramoan. We reached Gota Village Resort in Caramoan Island around 3pm. On the 28th, we checked out at 5am, to catch the 7am boat ride going to Sabang Port. On our way back to Manila we passed by Basilica de Penafrancia and other churches. before hitting the long road to Manila. I thought that our Bicol adventure was done when we reached Quezon Province. We were all so tired and eager to go home so John and I decided to hit the shorter but steep road of Bituka ng Manok (chicken intestine) at Atimonan, Quezon. where you can trek, dine and buy pasalubong and take lots of pictures. There we met and shared a seat with a wonderful Sardona family where we exchanged travel stories. of which the traveler is unaware"